As a cyclist, it can be extremely inconvenient when there is not enough parking in the street, while many people cite a lack of safe and secure parking at work, home and while out and above as one of the major reasons why they do not use their bikes as much as they would like. The only way to make up the current shortfall is to provide hundreds of thousands more spaces, and many of these must be secure. The Cycle Parking Campaign is now encouraging cyclists to express their need for cycle parking so that this can be passed on to the mayor and local councils. · A greater number of secure cycle parking spaces must be provided at workplaces. Very few workplaces currently have secure bike parking in place, and enough is required to accommodate the needs of 15% of the workforce, and at academic institutions, a quarter of the students. · A huge increase is required of thousands more cycle parking spaces in on-street locations. Borough councils and the mayor must provide enough cycle parking at public destinations, and a minimum of 100,000 more spaces are required on the streets of London. · New planning regulations should be put in place ensuring that all office buildings are required to provide bike parking for a minimum of 15% of their workforce, and new developments should provide adequate parking for 25% of workers as a minimum. · An increase is required in the amount of secure bike parking provided at homes, with cycle parking being made standard for all newly built private residential developments and council estates. Provision should be made for a minimum of 15% of occupants. 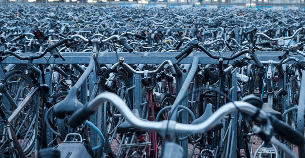 · There must be adequate cycle parking provision made at transport hubs, with a minimum of 500 at all of Greater London’s major rail stations and at least 200 of these being within a secured compound. · There needs to be better information provided on websites etc. on public buildings, especially within the Greater London area, about the location and provision of cycle parking.